These are just the beginning of ideas. 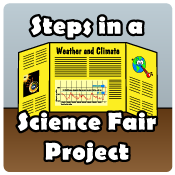 Ask a parent, teacher, or other adult to help you research the topic and find out how to do a science fair project about it. Measure the cloud cover in the sky. Demonstrate how Earth's water cycle creates fresh drinking water from sea water. Investigate the greenhouse effect outdoors, over one week using two thermometers, two shallow open boxes lined with soil, with one covered tightly with clear plastic wrap, and a notebook for taking temperature readings through the day and night. Or use a different, but well-controlled method of comparison. Make a do-it-yourself rain gauge. Measure the rainfall during one storm or over several days. Make a cloud in a bottle. Demonstrate why the equator is warmer than other parts of Earth (unequal heating of Earth's surface) using a flashlight, graph paper, a ruler, and masking tape. Compare the freezing point of fresh water with the freezing point of seawater or salt water, with varying amounts of salt. By the way, what is science anyway?